Since the inception of 2015, numerous sporting events of note have taken place. One of the most prominent events was the annual Orange Out, but John Paul also witnessed its second Division I signing. 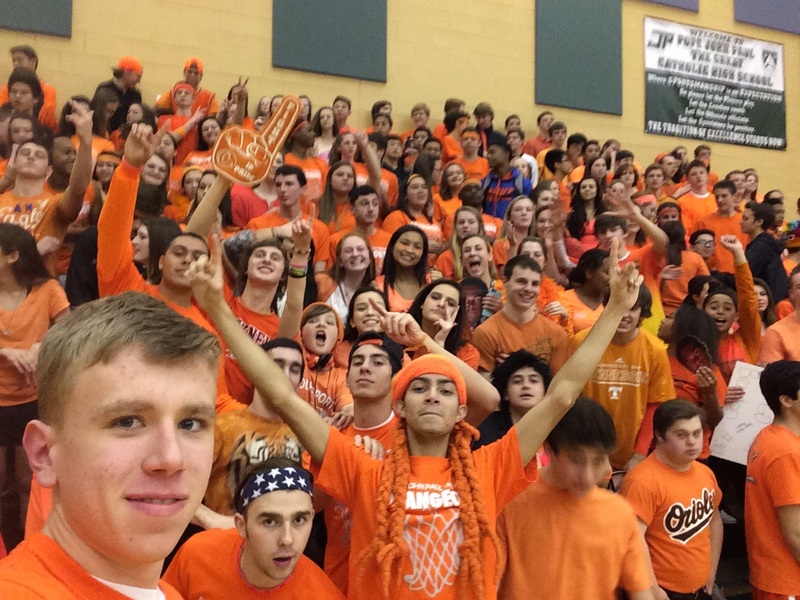 On January 24th, 2015, John Paul gathered together in its annual Orange Out event. The event celebrates the life of student Sarah Jakielski, who passed away from leukemia on December 13, 2011. Students wear orange, the color designated to Leukemia, to raise awareness for that type of cancer. The fourth and culminating game of the day was the varsity boys game. The team took on Fork Union Military Academy (FUMA), seeking their first Orange Out win since the initial event back in 2011. The game was close throughout, and fans grew restless as the fourth quarter wound down. With the score hovering around a tie for much of the final quarter, the game was set up for an epic finale. The score was 69-67 in favor of FUMA, and the Wolves had one last possession to tie or win the game. As the clock ticked down under 10 seconds, the noise level grew as the crowd watched to see what would happen. Brandon Edmonds launched a three, but missed. However, teammate Tom Gregoritis ran from under the basket, jumped, caught the ball, and threw up a reverse lay-up just before the buzzer sounded. The ball rolled around the rim but did not fall through, and the Wolves fell by a final score of 69-67. For only the second time in school history, John Paul witnessed one of its student athletes sign a Division I National Letter of Intent. In the world of collegiate athletics, this is a major accomplishment, as it signifies the culmination of that player’s hard work. The letter means the student has committed to play that particular sport at the Division I, or highest collegiate, level. In February of 2012, then-senior Kelly Donovan signed her letter to play soccer for American University in Washington, D.C. This year, on February 3rd, senior Josh Cox signed his letter, also to play soccer. He will be attending the prestigious College of William and Mary in Williamsburg, Virginia. Josh has been a standout on the Wolves’ varsity soccer team all four years at John Paul, and we wish him the best as he continues his career just a short drive south of here. “Watching my hard work unfold in front of me was a very fulfilling feeling,” said Josh. Girls Basketball – The varsity girls basketball team played valiantly from game to game. Significant wins on the season came against Brentsville District High School and Trinity at Meadowview. Taking what they learned from seniors Ashleigh Conkright and Hannah McNulty, along with their game experience, the younger members of the team will look to use that experience from this season and have a strong record in the coming year. Sean Tully finished fifth in the boys 1600m run and Andre Gallant finished third in the boys 3200m run. On the girls side, Tashana Simon finished sixth in the 300m dash, Caitlin St. Amour finished seventh in the 1000m run, Katherine Duquiatan finished fourth in the 55m hurdles with Tashana Simon was right behind her in fifth, and Danielle Borneman finished 10th in the Triple Jump. “Considering the fact that indoor is a lot more competitive I feel like we all got a good experience in a higher level of competition. States went really well and we had a lot of people place and get awards,” said Duquiatan. Josh DeLeoz finished ninth in the 100m breaststroke. Melanie Sherill came in 15th in the 500m freestyle. The girls A relay finished 13th in the 200m freestyle, while the boys A relay in the same event came in 15th. In the 400m freestyle relay, the girls A relay cut their time by 12 seconds and finished 9th, and the boys A relay came in 14th for the 400m freestyle. Wrestling – The wrestlers have continued to churn out strong performances at meets throughout the winter, including victories over Randolph Macon, Episcopal, and Covenant. In addition, Stephen Corbett and Daniel Gordon both earned gold at the Rumble in the Jungle on January 3rd. “What these past four years have taught me is that if you have the courage to commit yourself to wrestling, ordinary people can become warriors,” said senior Stephen Corbett. 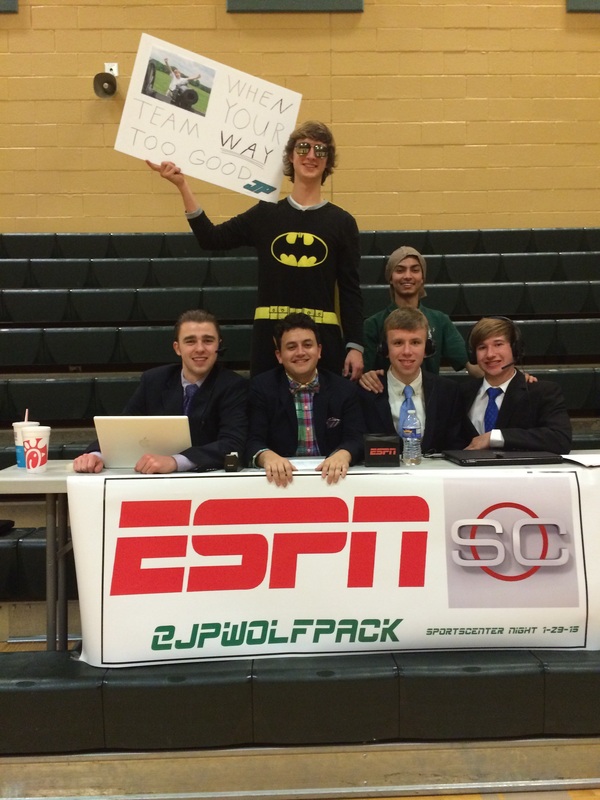 A trend has been circulating in high schools around the country of a SportsCenter theme for a basketball game. Naturally, John Paul joined in on the event and had their own SportsCenter Night on January 29th at the varsity boys basketball game against The Heights. Seniors Paul Fritschner, DJ Stefonsky, and Francis Bright, along with junior Josh Holmes donned fancy attire and anchored from behind a table in the student section. Stefonsky and Fritschner actually called the game into headsets and a computer, while Bright and Holmes conducted interviews during timeouts and other stoppages of play. The students also joined in on the fun, making numerous signs like those from College Gameday on ESPN. 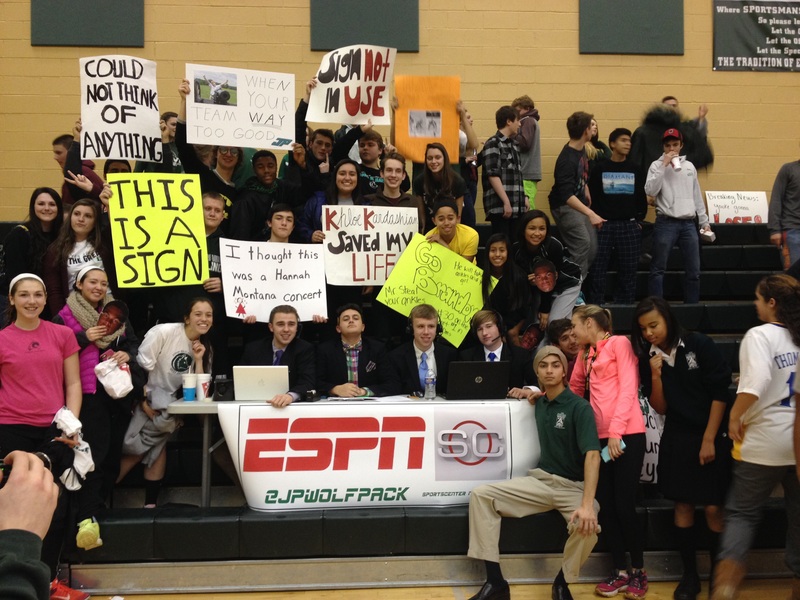 The crowd and their signs along with the SportsCenter crew. Barring snow days on Thursday and Friday, there are two major events to attend. First, on Thursday, it is the varsity boys basketball senior night. As Xayvin Johnson is the only senior, the game will be a White Out/Xayvin Out, so print out an X, wear something white, and come support the team in their last game of the season! The game is at 7 PM. Then, on Friday, it’s a basketball game between 2015 and 2016. There has long been debate as to which of these two classes had the better freshman basketball team, so Friday will be the resolution. The original members of both freshman teams who still attend John Paul will suit up and play a real, full game at 3:40 PM. Fans of 2015 will have a White Out and fans of 2016 will have a Black Out. It’s a Friday right after school, so pick a side and come have fun watching the game! One last note, spring sports start Monday, February 23rd. This entry was posted in Basketball, Basketball, Co-Ed Sports, Home, Indoor Track, Men's Sports, Swimming, Women's Sports and tagged American University, Andre Gallant, Ashleigh Conkright, Black Out, Brandon Edmonds, Brentsville District High School, Caitlin St. Amour, Class of 2015, Class of 2016, College Gameday, College of William and Mary, Covenant, Daniel Gordon, Division I, DJ Stefonsky, Episcopal, ESPN, Fork Union Military Academy, Francis Bright, Freshman Basketball, FUMA, Girls Varsity Basketball, Hannah McNulty, Indoor Track, John Paul, Josh Cox, Josh DeLeoz, Josh Holmes, Katherine Duquiatan, Kelly Donovan, Leukemia, Melanie Sherill, National Letter of Intent, Orange-Out, Paul Fritschner, Randolph Macon Academy, Rumble in the Jungle, Sarah Jakielski, Sean Tully, Senior night, SportsCenter, SportsCenter Night, Spring Sports, Stephen Corbett, Swimming, Tashana Simon, Tom Gregoritis, Trinity at Meadowview, Varsity Soccer, Virginia, VISAA, Washington D.C., White Out, William and Mary, Williamsburg, Wolves, Wrestling, Xayvin Johnson, Xayvin Out. Bookmark the permalink.